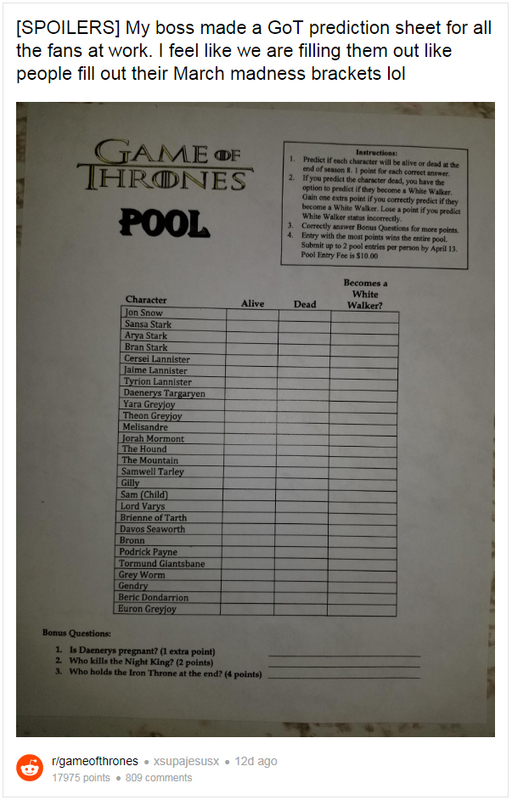 Just wondering if anyone would be interested in getting a season 8 death pool going. I've seen one someone made floating around and thought it would be a cool thing to do here. Could do it just for fun or maybe for charity and/or a non cash prize. How does a death pool work? This is the one I stumbled upon. I like the bonus questions as a tie-breaker. Count me in. I’ll be checking back to see if it’s able to get organized. I don't think I'd do very good, but I'd pick up what you're putting down. No option for the Night King to survive?? Even if it’s just for fun. 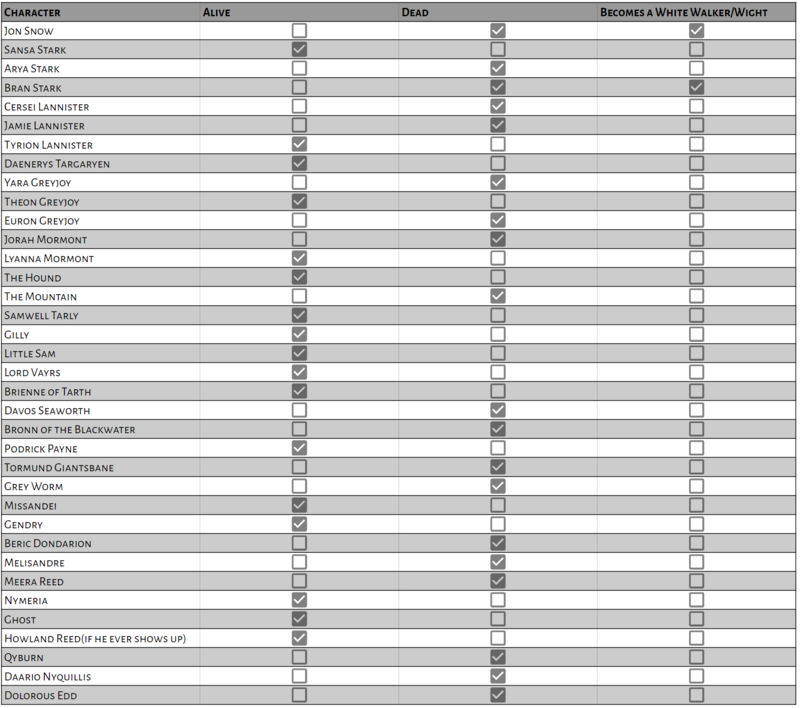 Could easily put a spreadsheet up on Google Docs and let everyone fill out their sheet. I would love this if just for fun. 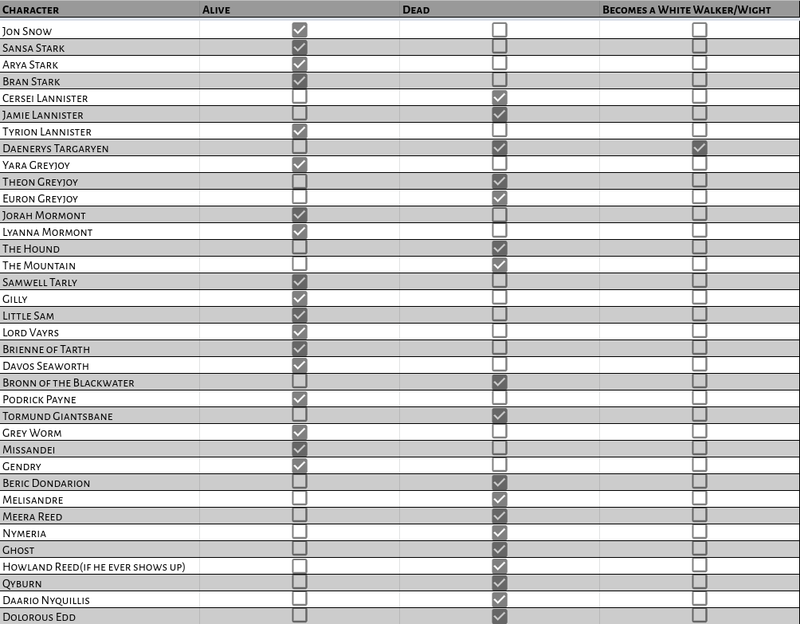 That might turn out to be the most shared google sheet in the history of google sheets. I would love to do this if we can get it together. Now that I'm home from work, I'm typing one up on Google. I'll add Ghost and Nymeria, is there anyone else that's been left off? Edit: Added Lyanna Mormont and Missandei. Ladies and Gentlemen, I present to you, version 1.0 of my GOT Season 8 Deadpool! I, David Foster, creator of this document, hereby give anyone who wishes permission to share and print this document. I locked down the original that I made so on a compurer just click "File" then "Make a Copy" and then you will have your very own editable copy that you can fill out. Those of you who are on mobile, click the menu button on the right, then "Share and Export" then "Make a Copy". Here's my predictions, in case we get an actual pool going. Can I mark everyone as dead except for Tyrion? 'Cause I'm kind of hoping he's the last person standing at the end of it all. Is there a way to load it via mobile? I've had no luck loading things before. Or should I just list? I'm not ready to make these kinds of decisions yet. It feels too real now. Jon Snow has already had a dramatic death scene. He won't die again. Gendry is being set up to replace Robert. Jon and Gendry need to survive so Jon can become king and legitimize Gendry. Jorah survived greyscale, so he won't die. Dany has been set up to be the queen of Planetos for the whole series, but her claim is now undermined by Jon, so her plot armor is gone. It will probably turn out that the White Walkers want a Night's Queen, and Dany will become that. Dany has been advised that she can't use the dragons to take King's Landing. After the war against the White Walkers, her armies will be too depleted to take it. So either somebody (Jamie/Hound/Arya) needs to go into King's Landing and assassinate Cersei, the White Walkers need to destroy King's Landing, or Cersei needs to leave King's Landing so she can get dracarysed. Sam, Gilly, and Little Sam have cold-rolled plot armor. They won't die. Brienne promised Cat she'd protect the Stark children, which gives all of them plot armor. Not sure about Podrick, but I don't see how killing him serves the plot. Jamie/Hound/Theon -- their redemption arcs need them to have heroic deaths. Probably Jamie will die killing Cersei, the Hound will die killing The Mountain, Theon will die killing Euron. Varys and Tyrion need to live so they can have a witty conversation about how they survived against the odds. Grey Worm and Missandei need to survive so their romance arc can climax. I don't see how Bron gets out of the war alive, since he's employed by the losing side. @telephoneofmadness I think I agree with majority of your guesses. I don't know how strong the plot armor that Brienne threw over the Stark children is I mean, let's ask Rickon...sad face. (I think her promise was actually just about the girls anyway) I don't think Sansa will die, but I can see it happening as a cheap shock death for the audience. And I really really hope Arya survives because she is one of my favorites but I really worry she is going to do something rash and get herself killed. I just want her and Jon to meet up again. There's a lot of Rose colored glasses in here. If you think this story has a happy ending, you haven't been paying attention. How unhappy can the ending be? If the final episode is Planetos being ruled by White Walkers or Cersei, GRRM can GTFO. I agree with you 100% for the books. It is likely that any ending with the good guys on top won’t be a happy one, but hard fought with a lot of main characters dying. However, I can see it being pretty easy to give a much more straight forward 80% happy ending on tv. They are going to need to let the audience connect with somebody at the end and it could result in a lot of the favorites living in the show even if they would have died in he book. Well does that mean ol' Pod will be the next Craster and use his magic rod and single handedly repopulate Westeros?